Home » About Flygirl Productions » Visiting Vancouver? Vancouver is the seaside, mountain-capped, LGBTQ-friendly cultural hub of BC, the best place on Earth. The Vancouver lesbian community is not contained in one part of town, but woven throughout the various villages that make up the city. Most of the city is pretty gay friendly, but there are particular parts of town where the Vancouver queer community gathers to eat, shop, strut, and play. The Drive, at the heart of East Vancouver, is known for the eclectic mix of people and lifestyles that intermingle in the many cafés and restaurants. There aren’t lesbian-specific spaces but this is where a lot of the Vancouver lesbian community works and hangs out. Much of the ‘life’ here happens in the daytime, but it’s a pretty lively area round the clock with venues that offer live music a few nights a week. The Vancouver Dyke March, which usually takes place one week before the Vancouver Pride Parade, wends through this part of town. Vancouver’s West End has a thriving gay community. Although the male population outnumbers the female, it’s a must-visit part of town. 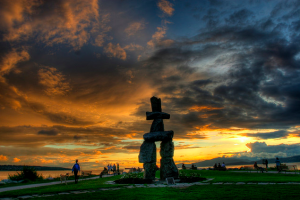 There are plenty of restaurants, café’s and lounges, and it’s the gateway to Stanley park. Take a stroll along Davie Street down to English Bay. Sip a latté and people watch on English Bay beach, head to Denman Street to rent a bike or rollerblades for a scenic trip around the Stanley Park seawall, or take a water taxi ride to the art studios on Granville Island. The West End plays host to the spectacular and spirited annual Vancouver Pride Parade and Festival on BC day long-weekend, which falls at the end of July or first week of August. 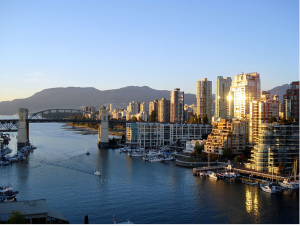 Main Street runs from the Fraser River to False Creek, offers sensational mountain views, and passes through Little India and Chinatown, before coming to an end right between Gastown and the Downtown Eastside. The most popular part of Main Street with the queer community is the Mount Pleasant neighbourhood (roughly between 5th and 29th Ave.), which abounds with funky cafes, restaurants, and vintage shopping, as well as a movie theatre, grocery stores, a great community centre, and some live music venues. 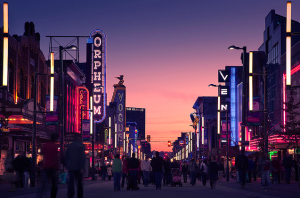 Granville Street is known as the entertainment district of Vancouver. There are no specific gay spaces, but plenty of tattoo parlours and all sorts of shopping, from vintage to designer. This area comes especially alive at night, with movie theatres, live performance spaces, and many clubs and restaurants. One of our favourite late-night stops is the Fritz European Fry House on Davie St. It closes at 4am on Fridays and Saturdays and is steps away from the Granville entertainment district. Wreck Beach – The infamous and clothing optional Wreck Beach on the UBC campus always offers something to behold. Vendors sell all kinds of things – from iced margaritas to sundresses to hamburgers. The crowd dwindles at sunset, but smaller circles often remain to chat around beach fires. Brunswick Beach – If you want a clothing optional beach that isn’t so much of a scene, dig around for information on Brunswick Beach in Lion’s Bay. This has long been a secret spot for Vancouver lesbians (and others) to beat the crowds and lie in the sun, but to get there you’ll need a car and a local guide as not only is the beach tough to find, the places to park seem to shift every summer. Vij’s restaurant (Granville and 11th). Vij’s is a tradition with our out-of-town DJs. The night after the parties, we all feed our bellies and souls with yummy Indian food. It’s a little pricey, but worth it. They don’t take reservations, but you get to sample delicious appetizers and even order drinks while you wait.